Here is my mindmap of connections. When the forums started to empty, around mid-course, and their demise accelerated after Stephen’s forced subscription, I found myself left with few souls with whom to kibbitz in the forums. So I made some up, based on some of my favourite people. I think Old Socs was first, then I Kant, L Tsu around the same time, followed up later by Jon Lenin. None of this was planned, just evolved (emerged, I guess) and was no doubt accelerated by the amount of good fun I had in doing so, and my sense of humour. It has been busy, keeping up contributions from each. 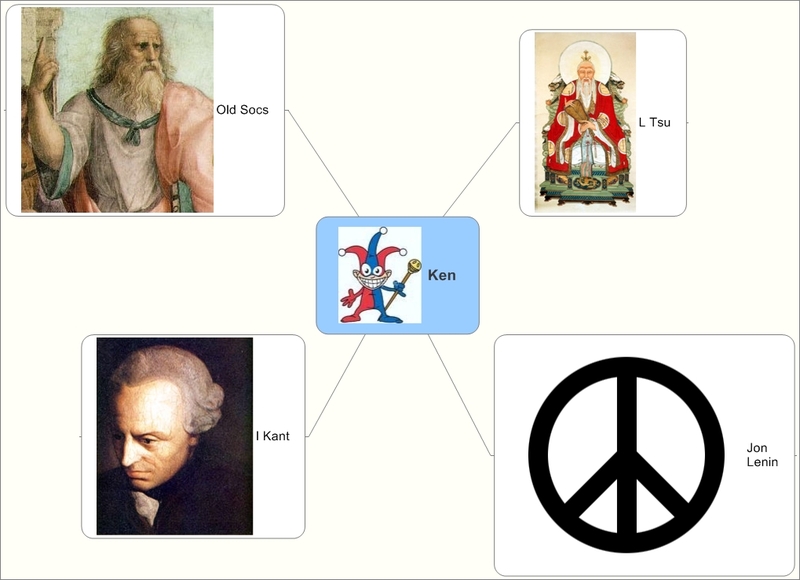 I have tried to assume the role of each, to some extent: Old Socs the questioner, L Tsu the mystic statement maker, I Kant the logician, Jon Lenin the social philosopher/entertainer, while not being overly concerned if they strayed off script. I think there are some things to be learned through this effort of mine, within this connectivist course. Perhaps there is a use for the avatar. I much enjoyed playing in the playground, and engaging with those that would engage. Interesting! Why are those avatars behind the scenes? Do they sound like the actors in a theatre playing? Is that similar to the actors in Actor Network Theory? How far do you trust their sayings? Are they all imaginary, fictitious figures? Just for fun? Or are they serious? Hello John. Well, a few short answers to your questions: In some ways I felt a little more comfortable operating behind an avatar – I had established myself as my real personna (Ken) and felt that I was likely known in a certain way. As a new character, I felt the liberty to expand or change the way I communicated and was received. A combination of fun and seriousness ensued. The fun was of course in the creation – finding a picture, pretending to be that entity, engaging as that entity. The seriousness emerged as the entity was involved in discourse, and I found myself sometimes taking on a viewpoint or position and defending it as I thought the entity might. I have enjoyed reading your posts. I found many of them very challenging intellectually. It was a perfect avatar to use … you injected delightful impish humour into my CCK08 experience. This is one of my best learning. You have won my admiration with your avatars.